The 2020 Toyota Supra is out now and now we get to dissect all the strange things about it with certainty. For instance: The lowest-spec Supra has a four-cylinder with less power than the controversial Toyota 86. As we know, under the skin the new Supra is basically a BMW, a BMW Z4 to be exact. So in addition to getting the BMW’s B58-code 3.0-liter straight six, Toyota will also put in the sister engine to that, the B48 four-cylinder. It’s part of the same engine architecture that also includes the B38 three-cylinder, and the B48 is kind of like a B58 with two fewer cylinders. Toyota just put up the full specs of the Supra for the Japanese market on its dedicated Supra site and one number on the right will stick out to car nerds everywhere. The lowest-spec Supra will come with 197 PS. That’s about 194 horsepower as we measure it converting from metric to standard. The more powerful four puts out 255 HP. Still, the lower-powered one leaves a lot to be desired. Even going off of Japanese specs as listed on the car’s Japanese wiki, the Toyota 86 makes more power, at 207 PS, or 204 HP. Be advised these aren’t for the U.S.-spec cars, and we don’t even know what the four-cylinder’s power will be here, but this is what other markets are getting. Our guess is America will only get the 255 HP one. If you’re hoping that the Supra makes up for this with even less weight, I have bad news. That basest-of-base Supra comes in at a claimed 1,410 kilos, or 3,108 pounds. Even the heaviest 86 is a spry 2,800 lbs. The wheelbase on the Supra is shorter as well (97 vs 101 in), though the full car is longer (172 vs 168 in). Toyota at least claims that the center of gravity is lower on the Supra than the 86. Below is as close to a comparo as I could get, though it’s a bit tricky. All in all, it’s odd that the Supra, most famous for producing huge power figures with its old indestructible 2JZ, will be available with less raw performance than a car lambasted since 2012 for not having enough grunt. I’ve driven one of the Toyobaru Twins and I never found it lacking in power—it remains a Jalopnik staff favorite all around—but it’s still funny that the Supra is a byword for big boost, big numbers. Where it’s really hard to parse things out is that not all that long ago Toyota was talking about a three-model sports car lineup. 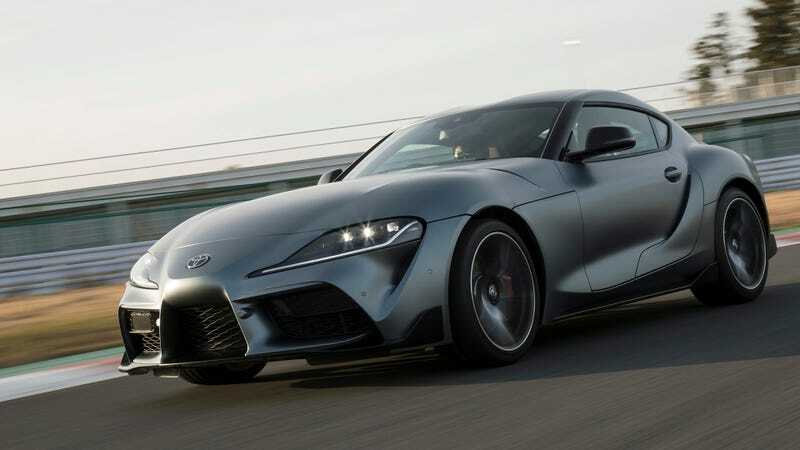 If the lowest-spec Supra is roughly on par with the 86, a car that’s been around since 2012, you start to wonder if the Supra is replacing that car in the lineup. And if it is, will Toyota be making two other new sports cars to fill out its desired three, or is it falling back on its plan? Why isn’t this four-cylinder Supra just called the Celica? Honestly, I don’t care. Show me a yellow one and I’ll be happy.